Writing these posts is a mixed bag. I like the cleaning, the organizing, and the sense of accomplishment I have when I finish. I enjoy writing the posts; I often discover something about myself or how we do things as a family as I write, and a lot of what I discover I use later to help in other areas of the house. I hate stopping to take pictures. I hate editing the pictures, especially since most of them are a far cry from pretty. I really hate posting them in a public forum! Sometimes I can’t believe I’m posting embarrassing pictures of our house online for everyone to see. That doesn’t make sense, except it does. Posting on the blog keeps me on task and motivated. God knows it keeps me humble. These pictures are worse than usual. Sorry about that! 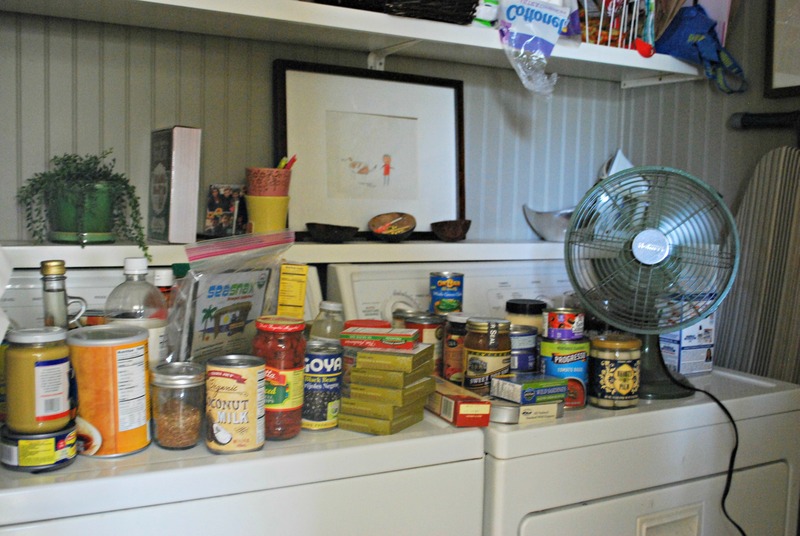 The pantry is in a very small laundry room. I can’t take a full picture while standing in the room, so to take these pictures I had to stick my arm into the room and click blindly. These are the best of the bunch! Where the pantry is now is where we believe once stood dryer or stacking washing machine and dryer. The wall where our washed and dryer sit now had a large window filling the entire top half of the wall. The previous owner removed it and enclosed the room to place their appliances underneath. 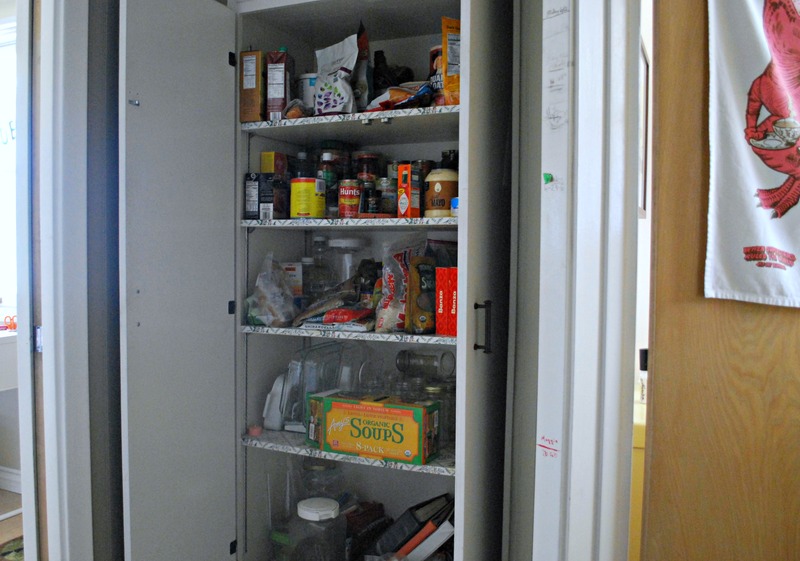 We’ve toyed with returning everything to its original layout, but we’d likely lose out on pantry space. Pantry space we clearly don’t use properly. I used the same technique to clean the pantry that I used to clean the refrigerator. I pulled everything out shelf by shelf. 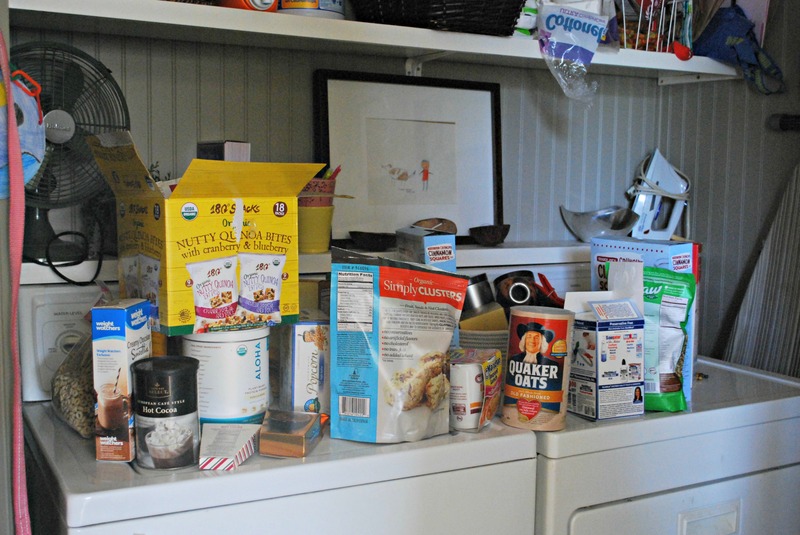 I tossed what was old or expired, donated what we weren’t ever going to use, and marveled at the random stuff on my baking shelf. There were ingredients there (corn syrup, crisco) that I don’t remember buying. I think the corn syrup was for a craft? Something to do with school? I have no idea. I kept it, though, because I don’t want to toss it until I remember why I bought it. I know it was school related, somehow. If I don’t remember soon, I’ll get rid of it. EDITED: I remember!! Nico used it to make a peanut butter-free bird feeder for Earth Day! Happy Earth  Day! Nico made a bird feeder out of an empty toilet paper roll, homemade edible glue, and bird seed. Here’s the after, and this is with me making no effort to organize anything. I did transfer opened grains into canning jars for reasons not tied to aesthetics. The boys don’t always close up their cereal and cracker boxes properly, and about two months ago we had a grain moth infestation as a result. We just can’t keep opened bags of grain or seed in the house without attracting the critters. No amount of chip clips have helped! I opened a tightly closed canister of bread crumbs and inside were moths! They flew out at me like Progresso’s Pandora’s Box! Screw top lids from now on. Period. Just yesterday I transferred all the rice into that big jar on the second to last shelf. 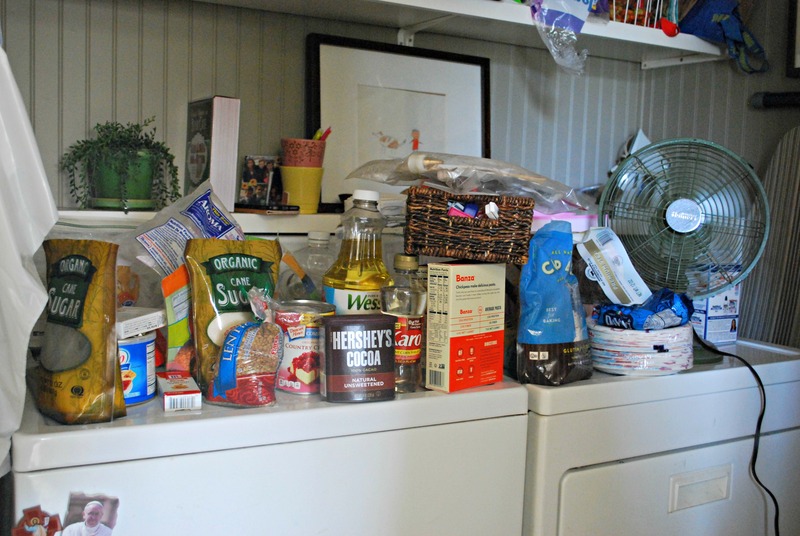 I always get comments on how little stuff we have in our pantry. We have food; promise! It’s just not snack food/packaged food, and most of our grains I keep stored in a grain pantry. 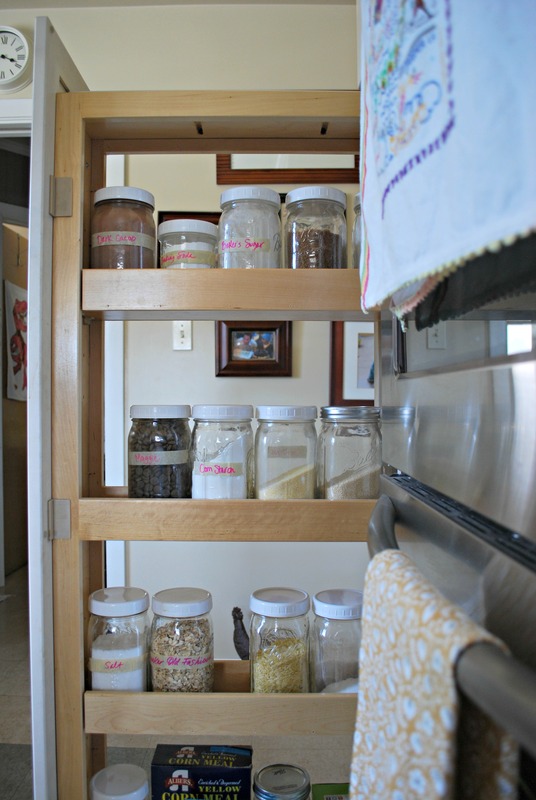 I store the flour in a fridge in the garage and spices in a spice cabinet. We mainly eat grilled or roasted meats and vegetables (no meat for Nico), so most of what we consume is stored elsewhere. 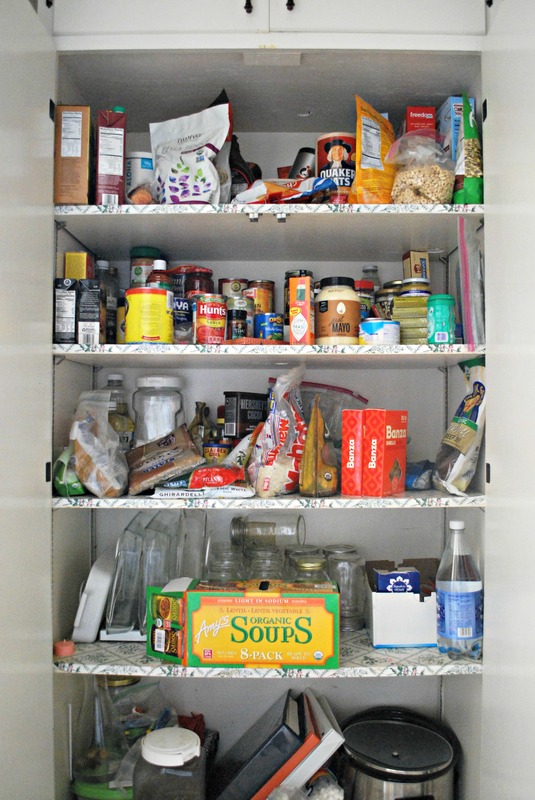 I just devoted a paragraph to justify the contents of my pantry. Blogging is weird. I was able to make some pretty random items using what I found buried in the pantry. I made a huge pot of pinto beans that the boys declared were “the best ever” using this recipe. I also made a tray of flax crackers using an unopened bag of flax meal I found. Those weren’t as great. I’m going to clean up the grain cabinet (pictured above) and the spice cabinet (not pictured). Maybe I’ll make granola bars or cookies with all the oats I found. It is highly adjustable to taste – the amount of liquid and eggs are the only non negotiables. We bake it in a 9×13 pan. I’m going to make this! I made a baked oatmeal a while back everyone loved, but I was looking for a cold slice-and-leave breakfast, and I thought granola bars. This is perfect! Thanks! I enjoy these posts, and your frankness. Keep it up! “Progreso’s Pandora’s Box” — LOL!! Back when I still kept a blog, I had real struggles with the whole picture thing. 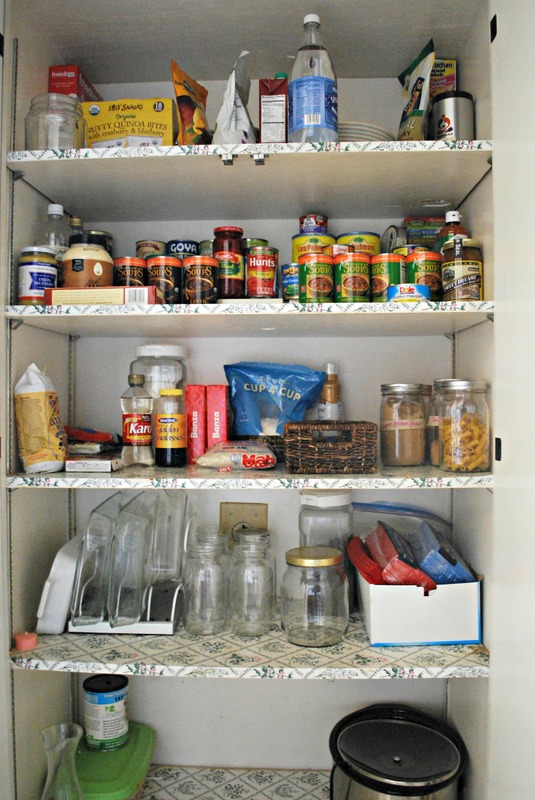 Once, I took Before/After pics of my pantry, and was so proud…until I started editing and realized that they were strikingly similar photos, and couldn’t bring myself to post them. Great for making me dig deep; sucky for every other reason. Usually, though, I just completely forgot the whole “Before” thing. Lot of problems. I struggle to get anything done without some sort of external accountability – I’m terrible at keeping promises to myself, even if it’s something I actually want to do – so I completely understand how blogging would help to keep you on track. I can also imagine how taking, choosing, and editing the photos would be the worst part! That said, your less-than-perfect photos are more inspiring and encouraging than you might think. Nice work on the pantry. Around here, oats typically mean Anzac biscuits (thin, hard, sweet cookies made with oats, coconut, and golden syrup) and the eternal debate over whether they should be crunchy or chewy. I want the fan. It’s adorable.